Social workers in the emergency department are often undervalued and the first to be cut in downsizing. But their vital services not only improve patients’ quality of life, they help avoid unnecessary admissions. In TV medical dramas such as the once-popular ER, social workers are often portrayed as minor characters with bit parts, called in primarily to help abused children, sexual assault victims, and older adult patients. However, the social worker’s role in the emergency department (ED), especially in busy urban hospitals and major trauma centers, is integral to smooth operation during crisis situations for effective patient management and for successful communication with a patient’s family members. Research indicates that social workers in the ED can actually reduce overall hospital costs related to patient admissions. In today’s cost-cutting hospital environment, social work services may be among the first eliminated by hospital administrators, and the important contributions of social workers in the ED are often undervalued. Susan Mason, MSSW, PhD, and Charles Auerbach, PhD, professors of social work at the Wurzweiler School of Social Work at Yeshiva University in New York City, have coauthored two articles and one book chapter on the work of social workers in EDs. Their publications are based on an empirical study of hospital data related to patient evaluation and management by social workers in the ED of a large New York City teaching hospital. Their data analyses highlight the value of social workers in the ED and to the hospital in general. In a recently published study, Mason and Auerbach found that connecting patients to the services they need at home and in the community avoids unnecessary hospital admissions and reduces insurance costs. In an urban acute care hospital, ED social workers were often referred complicated cases and used psychosocial evaluation methods to identify relationship and environmental issues associated with a patient’s medical condition that were less likely to require hospital admission. “Based on our study data and our interactions with hospital social workers, the most valuable role is to keep people from being admitted unnecessarily. Over 80% of the ED patients who were seen by social workers were not admitted and were instead referred to community services, home care, and nursing facilities,” says Mason in an interview, also speaking on behalf of her research partner Auerbach. In a related article published in 2009, the pair reported that social workers in psychiatric EDs also reduced hospital admissions through utilization of outpatient mental health facilities and community resources. The most valuable qualities an ED social worker can possess are good crisis intervention skills, the ability to perform quick and accurate assessments, and the personality to develop and manage an intense therapeutic alliance in a short period of time, says Linda Lenander, MSW, LCSW, a social work consultant and former director of clinical social work for Denver Health who worked as a social worker for 12 years in the hospital’s ED. “ED social workers must be able to go from a quiet, slow day to a busy multiple-car crash situation almost immediately. They need the ability to interact with a fast-moving medical trauma team, to relate to anyone and everyone,” says Lenander. In the hectic ED setting, patience, calmness, and good listening skills are essential, adds Katherine van Wormer, MSSW, PhD, a professor of social work at the University of Northern Iowa, who has had experience in hospital mental health services. These skills help social workers succeed in dealing with patients with mental disorders, triaging accident victims, counseling victims of violence, and communicating with patients and their families. At Denver Health, a major trauma center, the most common duty for an ED social worker is working with patients in critical condition and their families, says Lenander. “Social workers provide the important liaison between medical staff and a patient’s family members,” she notes. Preparing a family for the physician’s potentially bad news following treatment, providing open and honest information about their loved one’s condition, and dealing with end-of-life issues such as organ/tissue donation are the purview of the ED social worker. According to Lenander, the ED social worker must effectively address acute grief reactions from family members and mobilize a support system for them if the patient does not survive. “The ability to perform crisis counseling and set a positive tone for acute grief counseling on the spot is essential,” Lenander says, and part of the intense therapeutic alliance formed among the patient, the family, and the social worker. For patients who are victims of sexual assault, abuse, or violence, social workers help them and their family members or other supporters through the long ED process. “Helping them make sense of being victimized and the resulting feelings sets the foundation for follow-up care,” Lenander says. An ED social worker encourages victims to pursue follow-up care by providing the appropriate resources and referrals to inpatient or outpatient social workers or other medical and/or mental health professionals. Social workers are also called in cases requiring child protection and may assist in forensic interviews of children with suspected physical, sexual, and mental abuse or neglect, according to van Wormer. van Wormer says social workers can contribute to ED patient care by providing education to patients and family members in cases involving home accidents or domestic violence. For example, a social worker may educate a family about the dangers of guns in the home following an accidental shooting or instruct a victim of domestic violence how to establish a safety plan for leaving the home and seeking safety. The ED social worker’s job does not involve caring only for patients; they also provide much-needed support for medical staff, whose primary focus must be providing fast, effective treatment to patients with critical injuries or diseases, says van Wormer. “Social workers can reduce stress on the medical staff by taking care of the psychological needs of the patient, preparing them mentally for difficult or complex medical treatment, or assuring them that family members have been contacted,” she notes. This allows the medical staff to better focus on emergency medical treatment. 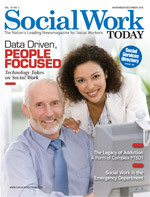 Social workers can also facilitate camaraderie among the ED medical and social services staff by acknowledging the unique setting of ED care and the occasional use of humor in relieving the high levels of stress associated with work in an ED (see sidebar). Once emergency medical treatment is delivered and patients are stable, social workers provide valuable feedback for physicians and nurses that assists in overall patient care and disposition, says Mason. When ED patients cannot return to their original situation, for example, when they are homeless or were in a violent domestic situation, the social worker must find the appropriate level of care needed—a shelter, a long-term care facility, a skilled nursing home, etc. According to Lenander, ED social workers must deal with difficult dispositions, an essential skill she refers to as “creative discharge planning.” A successful ED social worker must therefore have good detective skills, she says, and be able to discover facts that do not come to the ED with the patient. For example, is a lost, confused, injured patient brought in off the street a homeless person in chronic decline, an older adult with dementia who wandered away from home, or someone in an acute mental state caused by a psychiatric condition or drug abuse? Medical staff members generally focus on the medical history that is easily obtainable and relevant to emergency treatment, not ancillary information that may help with care outside the emergency setting. ED social workers face several other challenges, according to Mason. Language and cultural differences and insurance issues are common in larger urban hospitals that may serve minority communities and undocumented patients. Other hurdles that social workers may face include waiting lists for community services to which patients need referrals and resistance from both patients and family members to recommended follow-up services. In EDs with a long history of strong social worker presence, these difficulties can be foreseen and solutions can be worked out in advance, says Mason. Experience and knowledge help the ED social worker interact successfully with the medical staff in surmounting these and other challenges, says Lenander. “Once you prove your value, you become a member of the patient care team with medical staff. Your opinion as a social worker is then sought after and respected,” she says. ED social work is evolving, but where the field goes depends on the hospital; some hospitals are being forced to cut social work services while others are expanding, says van Wormer. Increasing economic difficulties are leading to heavier ED use as individuals without health insurance seek medical care there. More ED visits, coupled with budget cuts, have led to the current cost-cutting measures in many EDs. Unfortunately, hospitals may not realize the value of ED social workers, and this current trend toward cutting emergency services often begins with social services—and patients could suffer as fewer social workers are available in the EDs of some hospitals. On the other hand, some well-funded and university-connected hospitals have expanded to provide excellent, comprehensive social work services, including 24-hour emergency care and crisis intervention counseling, says van Wormer. Statistics recently released by the Agency for Healthcare Research and Quality reported that nearly 12 million of the 95 million visits (one in eight) by adults to EDs in the United States in 2007 involved patients with a mental disorder, a substance abuse problem, or both; 43% of cases involved depression, 26% were for anxiety disorders, and 23% were for alcohol-related problems. The agency also noted that visits related to mental health and substance abuse were 2.5 times more likely to result in hospital admission than visits not involving mental disorders or substance abuse. These conditions are easily identifiable during an ED assessment by a social worker. Reducing or eliminating social worker involvement in ED patient management may lead to unexpected consequences related to higher hospital admissions costs for ED patients with conditions requiring mental health services. Mason and Auerbach suggest that increasing, rather than decreasing, the presence of social workers in EDs is necessary for the future of ED social work services. “Hospitalization is for most patients a temporary solution. More social worker involvement in EDs can be a huge help to patients and families in delivering the resources and help they need after discharge,” says Mason. Social work in the ED is set apart from other social work by its speed, intensity, and teamwork, says van Wormer. Clearly, ED social workers play more than a bit part in the successful management of patients in the stressful and unique ED setting. Their ongoing dedication and hard work behind the scenes in the ED deserves a moment in the limelight. — Jennifer Van Pelt, MA, is a Reading, PA-based freelance writer with 15 years of experience as a writer and research analyst in the healthcare field. She has written on depression, attention-deficit/hyperactivity disorder, schizophrenia, mental wellness, and aging. The use of humor in the medical setting is a controversial issue. “Gallows humor”—often graphic and offensive—is common among emergency department (ED) medical staff due to the high stress level experienced every day in this intense care setting. “Humor prevents burnout and helps provide emotional release for those dealing with constantly disturbing situations. Laughter is a wonderful physiological release and distraction that enables medical staff to continue to function in the high-stress environment,” explains Katherine van Wormer, MSSW, PhD, who published an article on humor in the ED. She says social workers must understand why medical staff use this type of humor; it is a reflection of their strength in the fast-paced, stressful ED setting. Gallows humor is a coping mechanism, she says, and social workers should view it as a normal response by medical staff to an abnormal situation, used to relieve tension and strengthen camaraderie. Obviously, gallows humor should be confined to ED staff members and never used within earshot of patients and family members, she adds. Ethically, is it ever appropriate for social workers to use humor with patients in the emergency setting? “Social workers must be extraordinarily careful and circumspect whenever they consider using humor in emergency work,” says Frederic G. Reamer, PhD, a professor in the Rhode Island College School of Social Work. According to Reamer, there is a risk that patients will feel offended or that social workers are minimizing their intense pain and anxiety. Or patients may feel that social workers are using humor to alleviate their own anxiety rather than focusing on the needs of their client. However, he says, there may be select moments when some humor is appropriate, constructive, and even therapeutic, particularly if a patient initiates the humor as a way of coping with difficult emergency circumstances. “A social worker who joins with a patient who initiates humor may help that patient endure a very stressful situation,” he explains.